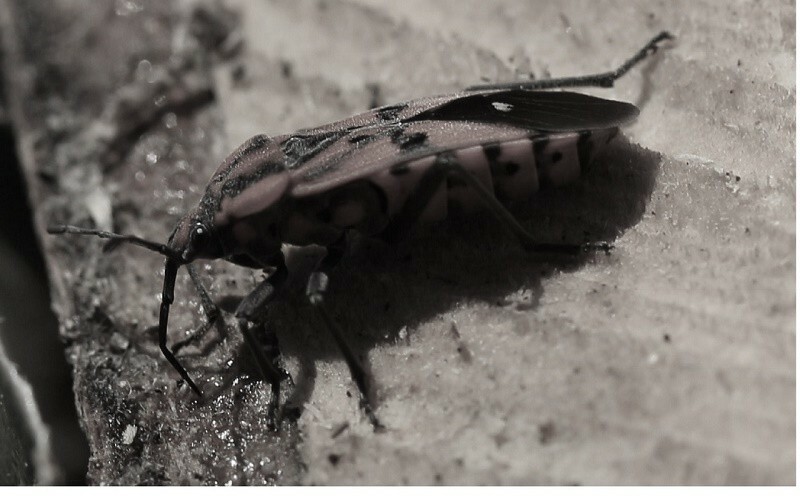 Elm seed bugs are the latest invasive pest causing problems here in the United States. Common to central and southern Europe, it’s unclear how they arrived but at this point in time, they’re making their presence well known througout the mid west. The main problem with elm seed bugs is they can live a long time. In fact, most will live 3-5 years. This means they’ll have to migrate out of bad weather looking for a good place to live for winter. And it appears these migrations will happen in the late summer and fall. So like many other invasive pests, elm seed bugs will look for safe harborage amidst the cracks and crevices of natural structures. That means during their flight from bad weather, they’ll be finding our homes and other buildings on which to roost and nest. And once on the home, they’ll forage up under house siding, around gutters, facia boards, windows, door frames and roofing. Once in these voids, it’s only a matter of time before they’re found in living spaces. Elm seed bugs look a lot like BOXELDER BUGS. Their basic shape is the same but Elm Seed Bugs are tan or brown and Boxelder Bugs are red to orange. Elm seed bugs eat tree seeds and won’t pose a threat to the tree or plant from which the seed is dropped. Elm seed bugs grow through stages known as instars. These start very small and resemble adults but with shorter wings. They’ll hatch in the summer and after 1-2 months, reach maturity. Elm seed bugs are smaller than Boxelder bugs achieving lengths in the 1/4 to 3/8th inch range. Like stink bugs, elm seed bugs will release a scent used to mark territories. These scents are used to mark good places to nest so once your home is identified as a good nest site, more seed bugs will find it year after year. Elm seed bugs will release this odor as a type of defense if handled. They don’t appear to pose a hazard to people or pets but their smell is obnoxious and persistent so avoid touching them. Elm seed bug control should be done outside the home once you identify them as being active in your yard. Seed bugs will readily roost in trees but are commonly found on the ground under the drip line of infected trees. Eggs and instars will thrive in the mulch or thatch laying on the ground and will develop well in these areas if left untreated. Basically anywhere tree seeds can fall elm seed bugs will target. For this reason, it’s best to get them in the yard on the ground before they start migrating onto and into your home. When first found in the yard, treat the turf with BIFEN GRANULES. Treat every 3 months to maintain the area and keep it seed bug free. Apply 1.5 lbs of granules every 1,000 sq/ft so our small back can cover 7,500 sq/ft and the large bag, 16,500 sq/ft. Treat once in the summer and once in the fall for long term control. After applying the granules, spray all trees, shrubs and ground cover with CYONARA RTS. 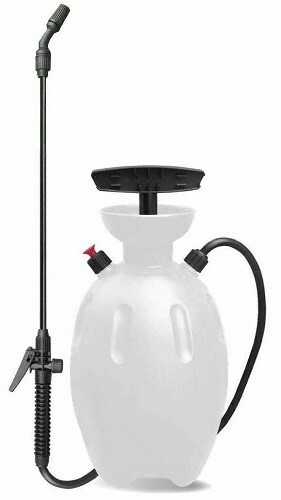 This odorless concentrate comes with its own hose end sprayer so you just need to hook it up to your garden hose and to spray. Packed in quarts, one jug of Cyonara will cover 16,000 sq/ft of turf. Treatments will kill off all activity quickly and should be applied after applying the granules. In general, one application in the summer and one in the fall will take care of any local problem but if you notice new activity following the treatments, spray again. In the fall, Elm Seed Bugs will start looking for a safe place to overwinter. This is when activity will be noted on the home around windows, doors and on the siding. If given the chance, they’ll move into any crack or crevice they find. Typically they’ll be active on the home for 1-2 weeks and then they seem to disappear. But in most cases, this means they’ve moved under the siding and if that happens, you’ll start finding them inside. To prevent an inside problem, spray the homes siding with CYPERMETHRIN. Highly repellent to invasive insects trying to use your home for hibernating, treatments made to your homes siding will both kill elm seed bugs presently there and repel them for several weeks. In general, one thorough spraying in the fall will keep them away for up to 1-2 months. Mix 1 oz per gallon of water and use over 500 sq/ft of siding. Apply the Cypermethrin using any good PUMP SPRAYER. You can also use our 20 GALLON HOSE END SPRAYER. Using the force of your outside water spigot, it can generally reach higher compared to the pump sprayer. Once in the home, elm seed bugs will be leaving their scent all over and making a mess. To control active populations, use PHANTOM AEROSOL. 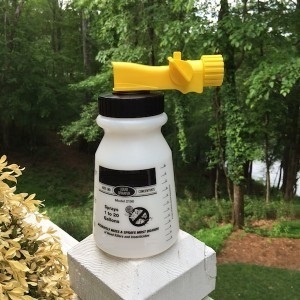 This is a low odor product that comes with a special injector tube so you can direct the spray into the cracks and seams where elm seed bugs like to hide. Phantom goes on dry when used properly so it won’t make a mess. The only drawback of Phantom is that it won’t kill quickly but this is by design. In fact it will take a good 1-2 days before you see results but this way it won’t spook or chase the bugs around. Phantom uses a unique active ingredient which will get transferred from one bug to another. This means that even if only 1-2 bugs touch a treated surface, you can effective impact hundreds after it returns to their nest. One can is enough to treat the average home 2-4 times and should be applied once a week until no more bugs are seen inside. Once gone, retreat once a month for ongoing insect control. We have a terrible invasion of these elm seed beetles and I want to order some of your solutions but I have a couple of questions about it first. I feed the wildbirds and hummingbirds, will this affect them in any way? Also I am worried that it might harm the bees that visit my honeysuckle bushes and other flowers, will they be affected? If you are treating the home to keep them out, the treatments will not affect any insect except those on the home when you spray. Once applied, insects will detect it and stay away. This is why its a good repellent. The same thing applies to bees. If you spray them directly, you can kill them. But if you spray surfaces they’re not on, they’ll stay clear of the area. This even applies to flowers. So if you spray flowers, bees will avoid them but they won’t be affected unless you directly treat them. As for birds and other wildlife; there will be no impact when these products are used properly. Simply put, they’re insecticides designed to target and affect insects, nothing more. We have 15×25′ Astroturf. Do you recommend spraying the astroturf and surrounding gravel? We have no real grass. We also have a dog that uses the astroturf. So if the bugs are in the astroturf, you’ll need to spray it with the Cyonara listed above. This product is safe enough to spray on fruits and vegetables you intend on eating so it won’t be a hazard to the dog. The gravel section should be treated with both the granules and the spray over the top. Lastly, if the bugs are getting on the home, spray the home’s siding too.